Tungurahua is a stratovolcano – a stratified, conical volcano that is both aesthetically pleasing and very dangerous. Stratovolcanoes, also called composite volcanoes, tend to be concentrated in areas where a plate of Earth’s crust subducts below another. This schematic diagram shows the internal structure of a typical stratovolcano. Image courtesy U.S. Geological Survey. Tungurahua is part of a chain of volcanoes that populates the Andes mountains. The Andean Volcanic Belt is a consequence of the subduction of the Nazca and Antarctic plates below the South American plate. The mountain, whose name may mean “throat of fire,” is one of 28 active volcanoes in Ecuador. All of that South American country’s volcanoes are part of the Ring of Fire. That belt of volcanoes largely encircles the Pacific Ocean and includes 452 volcanoes, about 75 percent of the world’s total. The mountain has a peak more than 16,000 feet above sea level. Tungurahua has now erupted three times since 2010. Those eruptions are part of a cycle that began in 1999. Prior episodes of eruptive activity occurred in 1773, 1886, and 1916-1918. More than 20,000 people live within ten kilometers of Tungurahua. Ecuador’s capital city, Quito, is about 140 kilometers north of the volcano. Tungurahua is located within Sangay National Park. Tungurahua is shown erupting at night during July 2015. Photo courtesy National Polytechnic School, Geophysics Department. Mount Sinabung is also a stratovolcano and is located on the island of North Sumatra. Before eruptions in 2010, 2013, and 2014, the volcano was last active in the 1600s. There are four craters on the mountain. Mount Sinabung’s peak sits at an elevation of about 8,069 feet. More than 13,000 people live within 10 kilometers of Sinabung, according to the Smithsonian Institution’s Global Volcanism Program website. Mercury, long thought to be a planet without the ingredients necessary for volcanism, was volcanically active as recently as one billion years ago. Scientists learned, as a result of a 2008 discovery by the MESSENGER spacecraft of pyroclastic ash deposits on the planet’s surface, that the solar system’s smallest planet has experienced volcanism. The general assumption has been that Mercury’s volcanic activity must have occurred early in the planet’s history, about 4 billion years ago. Newly-published research indicates that some of the pyroclastic ash deposits seen by MESSENGER were actually deposited between about 1 and 3.5 billion years ago. That means volatile compounds, which drive the explosive eruption of volcanoes, are likely more prevalent on Mercury than has been thought. “Mercury, contrary to predictions, is not deficient in volatiles, but instead has an abundance of them, “ Sean C. Solomon, the director of the Lamont-Doherty Earth Observatory at Columbia University and MESSENGER’s principal investigator, said. Using data obtained by cameras and spectrometers on board MESSENGER, a team of scientists examined 51 sites at which the ash was deposited. They observed that the vents through which the ash was expelled onto Mercury’s surface exhibited varying degrees of erosion and determined the age of the craters in which the ash exists. The difference in the erosion of the vents shows that ash was deposited on the surface of the planet at a variety of times during its history. The fact that some of the craters are older than the ash within them indicates that the ash must have been deposited in those craters after the impacts that produced the craters. Mercury’s large iron core has led to speculation that the planet may once have been significantly larger than it is now. Solomon explained that scientists have tended to believe either that some of its mass was either burned away by the heat of the nearby Sun or blasted away during a collision with another celestial object. If either of those events had occurred, most, if not all, of Mercury’s volatile compounds would have been eliminated early in its history. The new study’s confirmation that volatile compounds existed on Mercury until as recently as about 1 billion years ago casts doubt on those leading hypotheses about the planet’s formation. “It really does tie the geochemistry and the geology together, pointing toward an origin we didn’t expect,” Solomon said. Pyroclastic ash is produced by a volcano when it erupts. Volatile compounds in magma, such as carbon dioxide, hydrogen sulfide, sulfur dioxide, and water, change state from liquid to gas as the temperature of the magma rises and then expand, causing an increase in pressure that leads to the eruption. The new paper appears in the March 28 edition of Journal of Geophysical Research: Planets. MESSENGER was launched Aug. 3, 2004. Having completed its third year in orbit around Mercury last month, the probe is scheduled to crash into Mercury’s surface in March 2015. The European Space Agency and the Japan Aerospace Exploration Agency plan a joint mission to Mercury to be launched in 2016. 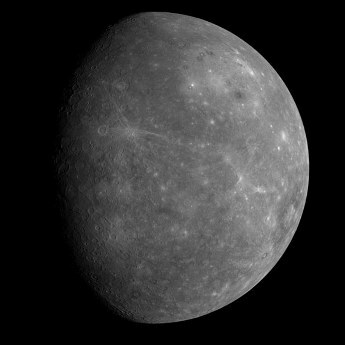 Image of Mercury obtained by MESSENGER on Jan. 14, 2008 courtesy NASA, Johns Hopkins University Applied Physics Laboratory, Carnegie Institution of Washington. Image courtesy Wheaton College, Johns Hopkins University Applied Physics Laboratory, Brown University, Jet Propulsion Laboratory, Unites States Geological Survey. Ganymede, one of the four satellites of Jupiter discovered by Galileo in 1610, has been mapped. 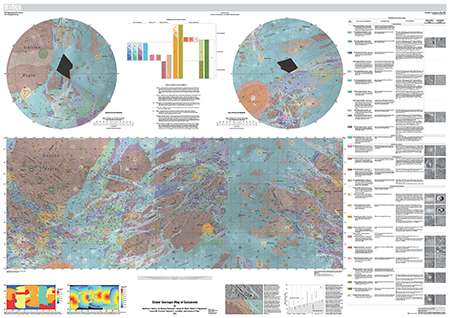 The geologic map of Ganymede’s entire surface is the first completed of any moon of the solar system’s outer planets. Researchers led by Wes Patterson of the Johns Hopkins University Applied Physics Laboratory and Geoffrey Collins of Wheaton College used images obtained by the NASA probes Voyager and Galileo to produce the map. “This is our best compilation of what we know so far,” Collins said. He explained that the map was drawn on the basis of data obtained by the Voyager and Galileo probes, which visited the Jovian system in the 1970s and 1990s. Jupiter’s largest satellite and the largest moon in the solar system, Ganymede is larger than both Mercury and the dwarf planet Pluto. It has an icy outer shell, about 500 miles thick, that was probably primarily the result of tectonic activity. Forty percent of the surface of Ganymede is covered by highly cratered dark regions, and the remaining sixty percent is covered by a light grooved terrain, which forms intricate patterns across Ganymede. . . . This grooved terrain is probably formed by tensional faulting or the release of water from beneath the surface. Groove ridges as high as 700 m (2,000 feet) have been observed and the grooves run for thousands of kilometers across Ganymede’s surface. The grooves have relatively few craters and probably developed at the expense of the darker crust. The dark regions on Ganymede are old and rough, and the dark cratered terrain is believed to be the original crust of the satellite. Lighter regions are young and smooth (unlike Earth’s Moon). Collins said that the map may help scientists figure out the source of Ganymede’s tectonic forces. Ganymede’s tectonic activity is likely the result of either tidal forces or a heat source inside the moon. One clue as to its genesis lies in the fact that changes in Ganymede’s surface do not appear to be constantly occurring. While the map may help researchers gain a more complete understanding of the moon’s history, it is not likely to answer all the questions about Ganymede. For example, while scientists are now reasonably sure that volcanism has not been the dominant shaper of Ganymede’s surface, there is a possibility that some craters are actually locations of volcanoes. “There are these very odd, strange pits that we found in a few different locations on Ganymede,” Collins explained. “On the map they are labeled as depressions. There are about four clusters of them. The map also provides no information about elevation on Ganymede. Scientists lack the detailed topographic data that could provide an answer to the question whether the more recent, light-colored areas on Ganymede’s surface have a different elevation than the older, dark-colored areas. Despite the uncertainties about Ganymede that remain, Collins thinks the new map is a big step forward for the scientific community. “It’s gone from being a point of light to being a world in its own right, with its own geology, its own history, its own geography,” he said. While the map is the first of an outer solar system moon, it is the fourth made of any moon. Earth’s moon, Luna, and two other Jovian moons, Io and Callisto, have been mapped. A map of Europa should be finished soon. “There have been preliminary copies floating around,” Collins said. The European Space Agency is scheduled to send the next probe to the Jovian moons. Known as the Jupiter Icy Moons Explorer, it will launch in 2022 and, upon arriving, spend three years studying Ganymede, Callisto, and Europa. The map was published by the U.S. Geological Survey. You can download it here. 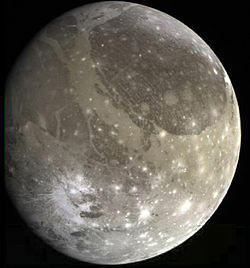 This image of Ganymede was obtained by NASA’s Galileo probe. Image courtesy Wikimedia. NOTE: This story was updated on March 3, 2014.